Where darkness dwells, embers light the way. 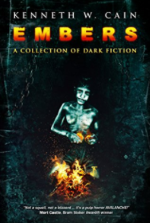 From the author of the short story collections These Old Tales and Fresh Cut Tales comes his latest effort, Embers A Collection of Dark Fiction. In his youth Cain developed a sense of wonderment owed in part to TV shows like The Twilight Zone, The Outer Limits, One Step Beyond and Alfred Hitchcock Presents. Now Cain seeks the same dark overtones in his writing. Theres a little something for every reader. These 25 short speculative stories represent the smoldering remains of a blaze, the fiery bits meant to ignite the mind with slow-burning imagery and smoky twists and turns. These are the very embers of Cains soul. 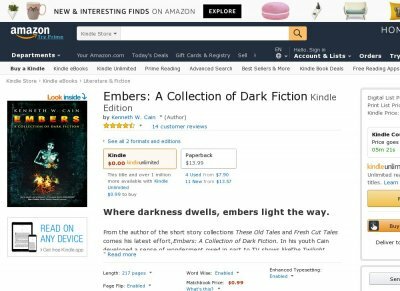 In this collection, Cain features stories of troubled men and women, both living and dead. Themes of loss and the afterlife take on many forms, as he explores the unknown. For instance, The Chamber focuses on a hardened veteran of World War II who has committed heinous crimes. He seeks only to find peace from his conscience, but sometimes that comes at a great loss. Valeries Window visits a small town amid a tragic end to humanity. Only things are not as they seem, and the more Valerie comes to know herself, the more her reality is revealed. The Benefit of Being Weighty has a humorous side, but the theme of this story revolves around fat shaming and the price one must pay for being so ignorant. Hopefully, these three short descriptions have increased your curiosity. When the dark comes, light a match. Let the fire burn bright and hot. So that when it dies the embers warm you.